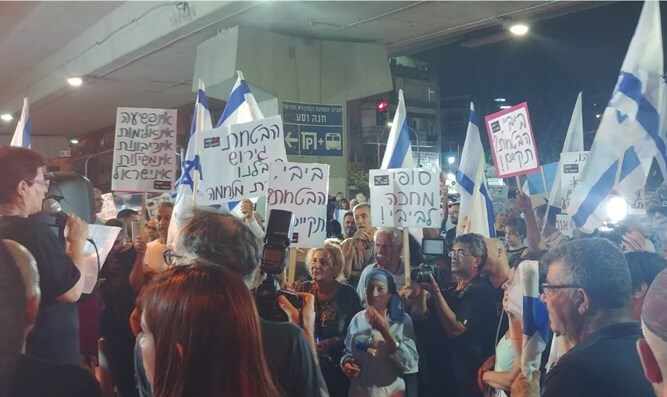 Hundreds of residents of southern Tel Aviv and their supporters demonstrated Thursday night against the large number of illegal infiltrators in their neighborhoods. During the demonstration, a number of participants were documented burning a picture of Interior Minister Aryeh Deri. Shefi Paz, one of the leaders of the struggle to remove the infiltrators from Israel, addressed the prime minister in her speech. "Binyamin Netanyahu, a year and three months ago you told me 'I promise,' and I was so afraid to believe you." "While the government is trying to sneak the surrender route through the back door, we have received the violence, riots and disturbances of the Eritrean civil war," said Paz. "Anyone who saw the gangs running through the streets like a skilled army, armed with rocks and sticks and axes and knives, anyone who saw them beat each other in a murderous rage and bleed on the sidewalks, and still thinks that the infiltrators belong here, he is a madman, an anti-Zionist, a stupid politician or a hired idiot. Paz added: "When you want, Netanyahu, you can. But you have to want is very much, as in the days when you boldly and courageously built the fence. This is the moment of truth or point of no return, and the choice is yours. You'll find your way. Be smart. Think out of the box. You will reopen the Holot facility. End the labor dispute in the Immigration Authority. Enforce the deportation law." "Bring the deterrent power back to the police. Go to Asmara (the capital of Eritrea) and drop [Isaias] Afwerki on his knees. Operate an airlift to Georgia and the Ukraine. You'll learn from the UN and return the bulldozers to Sudan. Amend the emergency regulations. Stop the infiltrators for any offense. You will institute a severe punishment for anyone caught without a valid residence permit. The main thing is that you keep the promise you made to Sophie exactly a year ago in the kitchen of her home: You will return the neighborhoods to the citizens of Israel," Paz said on behalf of the thousands of residents."